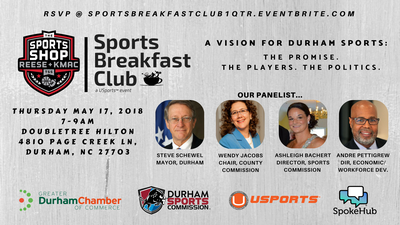 Join us for a roundtable conversation entitled, A Vision for Durham Sports: The Promise. The Players. The Politics. This will be the first in a series of unique, content-led conversations and events centered around Durham's Sports Culture, Business and Innovation. The Sports Breakfast Club | Do Business. Do Sports. Do Durham presented by USports Consulting, LLC and partners is designed as an executive coaching platform for business leaders, entrepreneurs, students, and sports sector partners across the community, who are passionate about sports and its economic potential in Durham.